Pain is a major disorder through which everyone goes at some or the other point of time in life. Pain starts and gets established in such a way that we become used to it so much that we even forget its presence, not to mention the fact that we don’t even bother to visit our doctor for pains. At the most we take painkillers and once the pain is suppressed with it, carry on our work, and this becomes a regular practice. However, we don’t bother to think upon whether the pain has really been cured. If you are serious about your pain and want to get rid of it once and for all, the best solution is to use a TENS unit! The good news is that SantaMedical has launched 16 Modes TENS Unit Electronic Pulse Massager which is extremely effective for treating your pain. How can the TENS Unit Help? 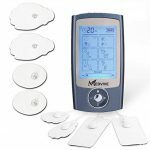 As you know a TENS massager works by producing a mild electric current that resembles the one produced by your nervous system, and thus relieves pain. It comes with massage pads that you have to adhere to your skin on the problem area such as neck, back, shoulder or waist, and get the massage which offers a pleasing feeling by producing the electric current and thereby gentle massage. The TENS electronic pulse massager by SantaMedical has 16 pre-programmed modes or intensity adjustments. Thus you get 16 massage modes in 20 strength levels. These modes range from Deep Tissue/Shiatsu massage to Low Intensity with Cupping, Knocking/Kneading, Tapping and Acupuncture. So, you can imagine how you can use this wonderful unit in a varied way, thanks to its diverse massage modes and strength levels. It also has an adjustable timer which allows you to use the unit for 10 to 60 minutes. Plus, it has an auto shut-off system; so, you don’t have to worry about forgetting to switch off the unit. The SantaMedical TENS electronic pulse massager has numerous features which make it very convenient to use. It has a large animated LCD screen which is easy to understand. It has a backlight so that you can read it even in the dark. It’s just pocket size and lightweight, and comes with a carrying bag; so, you can carry it in travel and use it anywhere, anytime. With a USB charger, you can recharge its rechargeable lithium battery at home as well as on the go. Last but not the least, this massager is entirely compliant with the FDA standards. So, now you can say ‘goodbye’ to your pain with this excellent TENS electronic pulse massager!